Main St. Monitor: The Best Of Many Worlds...And Lands. The Best Of Many Worlds...And Lands. Surprise? I was on Facebook today. Every once in a while, I do actually look at those ads on the sidebar. I like to ensure that the website I spend a better part of my day on (or, probably, life, it'll turn out) stays free. Sometimes, Facebook stalks my information correctly and an ad pops up that actually interests me. Usually, that ad is for something Disney related. 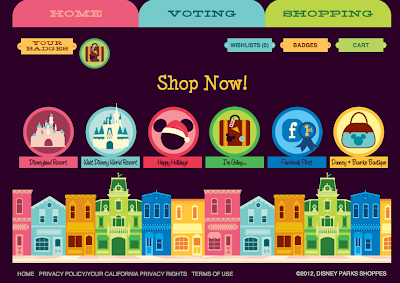 This time, a new app showed up called Disney Parks Shoppes. Normally, any word with a superfluous "e" at the end is an immediate turn-off, but when that word is preceded by "Disney Parks," I make an exception. I was first struck by the colors. I just finished taking a graphic design class, so now I know about that stuff in a more technical way, or whatever. What I really learned is that when something looks good, it looks good. Look, I just saved you $3,000. Back on point now. The app, or website, depending on how you access it, is very simple, with a aesthetically pleasing visual navigation, using minimalist inspired icons. Minimalism seems to the focus with the website, which is a good thing. Less is more when it comes to websites these days, and the people over at Disney know this. The new Disney.com is stripped down and thus has a much better design than the website it replaced. On the Disney Store website, they've been selling what used to be park-exclusive merchandise, which has been kind of a bummer because it takes away the novelty of only being able to buy something because you were there. Yet it is also cool, and for the opposite reason: if you can't make it to the parks, you can make the parks come to you in a small way. That's what this new website emphasizes: park merchandise, hence the name. The website sells a few things from both the World and the Land, along with seasonal merchandise, shirts that it labels "Facebook First,"for things that have a social media theme to it, and the Dooney and Burke Collection. It also has a weekly trivia question so you hang around the site longer than you should, and a section for merch that you'd buy before hitting up the parks, like Mickey Ears or some luggage. While shopping, you can compile a wish list and earn badges for different types of accomplishments, similar to things on Foursquare or Get Glue. I got one that was publicly shared for letting the app access my Facebook information and signing up. The site is essentially just another online storefront for Disney, but the clever people over there embedded some great social elements into it, so it feels more like a hybrid experience, instead of just giving Disney your money. Because why buy something if you can't show it off on your body and on Facebook?